Music is a diverse, exhilarating field. So put yourself in Nashville — Music City — and get a head start on your musical career. No matter what you want to do with music, our outstanding faculty will be available to support you every step of the way. The size of our program guarantees access to guest artists and excellent resources. We'll connect you to internships and help you network. Scholars, musicians, and entrepreneurs who have a heart for mentoring lead our small classes and ensembles — they’re ready to help you develop your unique gifts and abilities into a career where you can work and serve. Pursue your passion for music with our Bachelor of Arts degree. We've designed it to be flexible so you can grow in music, however you prefer. You'll get private lessons in your primary performance area and have the option for lessons in another area as well. Our students have freedom when senior recital comes around: standard format or unexpectedly creative. Prepare yourself to teach others about your passion for music. Our Bachelor of Music in Music Education leads to K-12 licensure in Tennessee — which is transferable to other states. So let us prepare you to teach in vocal/general or instrumental music. Guided by experienced teaching faculty in the College of Education, you'll learn how to plan and install classroom lessons and gain experience working and observing in public schools. You'll practice teaching and rehearsing performance ensembles, too. Our Bachelor of Music in Performance degree is especially for students who plan to work full-time as a professional performing musician. Our professional faculty will mentor you and work with you in private studio lessons. You'll gain experience as you perform as a soloist and prepare junior and senior recitals. You'll grow during auditions, competitions and workshops. Once you've earned your degree, you'll be ready to open your own teaching studio, start your performance career or move on to graduate study. Learn to write and compose music in diverse styles for performance with our Bachelor of Music in Composition. You'll get one-on-one private lessons from a faculty mentor. You'll get to prepare your junior and senior recitals and even submit your compositions for competitions or workshops. When you graduate, you'll be ready to start your career as a full-time, professional composer, or move on to graduate study. If you want to be a health care professional but have dedicated yourself to music, the Bachelor of Science degree in Music is perfect for you. We've designed curriculum that pairs math and science classes with music. You'll have the opportunity to work with science faculty in research projects as you continue in your dedication to music. You'll be well-prepared for the MCAT exam at the end of your junior year. We offer many ensembles and other opportunities within the School of Music. Our BA curriculum allows a student to major in one music area and to get significant experience in another music field. You’ll be able to work with extra ensembles beyond those required. And you’ll be given the option to take lessons in a second performance medium and take classes in a related music area. The senior recital allows a student the option to create a recital different from the standard. The BM will prepare you for the rigorous life of a performing musician. You’ll become a scholar in your performance medium. With private lessons, your performance skills and techniques will develop. The junior recital gives you the opportunity to plan, learn and perform a 25-minute program. The senior recital upgrades that opportunity to 50 minutes. There's a wide variety of learning experiences as you study to become a music educator. We'll teach you to become a scholar as you earn your music education degree. Our ensemble experiences paired with private lessons will teach you to be an outstanding performing musician. And our education classes will prepare you to plan, construct and implement lessons and experiences for your own students. As a composition major, you'll have access to diverse classes and experiences. Piano literature, solo vocal literature or instrumental chamber literature will be among those classes. You'll gain familiarity with different music styles as you learn choral or instrumental conducting. And you'll also study church music in order to understand that composition style better. A BS in classical music will give you the option of equally focusing on your music and science classes. Completing about 50 hours of music classes and 50 hours of science/math classes will lead up to graduation. You’ll work closely with faculty in both the arts and sciences to prepare for professions in the health care field. The School of Music’s largest classroom has 22 chairs. Teaching students can attend regional and national conventions of their professional organizations with faculty mentors. B.S. students have the opportunity to work with science faculty in research projects. 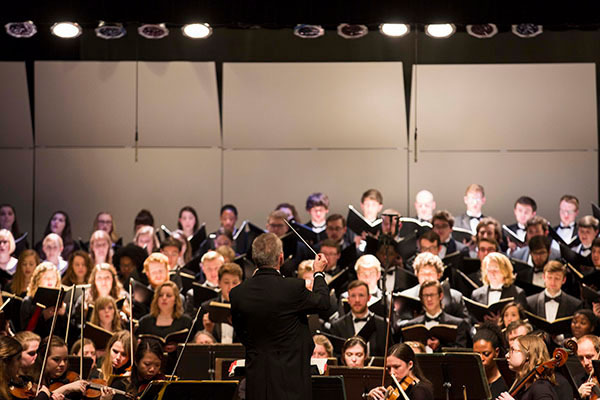 As a student choosing to pursue either a major or minor in classical music or a worship ministry major at Lipscomb University, you will be required to complete a performance audition and a music theory placement exam. A music scholarship audition may meet this audition requirement, or you may play or sing for the music faculty prior to the end of your first semester. All course prerequisites apply to electives. 8 semester hours of (50-minute) private lessons in one performance area, for credit; minimum 4 hours at 3000 level. Participation and passing grade in a major ensemble for eight semesters. 8 semester hours (50-minute) private lessons on major instrument for credit; minimum 4 hours at 3000 level. Participation and a passing grade in a major ensemble for 8 semesters. The Bachelor of Science degree in music is paired with math/science courses that prepare students for a professional program in the sciences. The degree includes courses in mathematics and science and prepares students for the MCAT exam at the end of the junior year. 16 semester hours of private lessons in piano; minimum 8 hours at 3000 level. 16 hours private lessons in voice for credit; minimum 8 hours at 3000 level. 16 hours private lessons on major instrument for credit; minimum 8 hours at 3000 level. 4 hours private lessons on secondary instrument for credit. 8 semester hours of one instrument for credit; minimum 4 hours at the 3000 level. 10 semester hours for credit in ensembles; 8 hours in a major instrumental ensemble (MU 1051 or MU 1081), 1 hour in choral ensemble, 1 hour in elective ensemble. 8 semester hours of private voice for credit, or 4 hours of private voice and 8 hours of private piano for credit; minimum 4 hours at the 3000 level. 12 semester hours for credit in ensembles; 8 hours in a major choral ensemble (MU 1001 A Cappella Singers); 4 hours in MU 1041 (Opera Workshop) or small vocal ensembles. 16 hours (50-minute) private lessons in composition for credit; minimum 8 hours at the 3000 level. 8 hours of (50-minute) private lessons for credit. Participation and passing grade in a contemporary music ensemble for 8 semesters (4 for credit). Participation and passing grade in a contemporary music ensemble for 4 semesters. All music majors and minors may audition for scholarships. These awards are based solely on the audition, and are not tied to any other academic scholarships for which you may be eligible. In addition, instrumentalists may audition for a participation scholarship. All scholarship recipients participate in the appropriate ensemble or, for pianists, the accompanying class. Conductors lead orchestras and other musical groups during performances and recording sessions. Composers write and arrange original music in a variety of musical styles.